I started researching recipes for lotion, lip balm, and the like after cooking with Sciabica's flavored oils. They smell so delicious! I’m so glad I followed through with this idea because wow, making this body butter today was such a treat. When you whip the ingredients together it’s an aroma therapy session! I am also thankful I had my friend with me today. I had Sciabica lemon and Louise had some Sciabica orange that I’d asked her bring over and share 4 tablespoons with me. What did she do? She gave me an entire bottle! And then she helped me make the body butter! We had such a great day, full of laughter and fun. 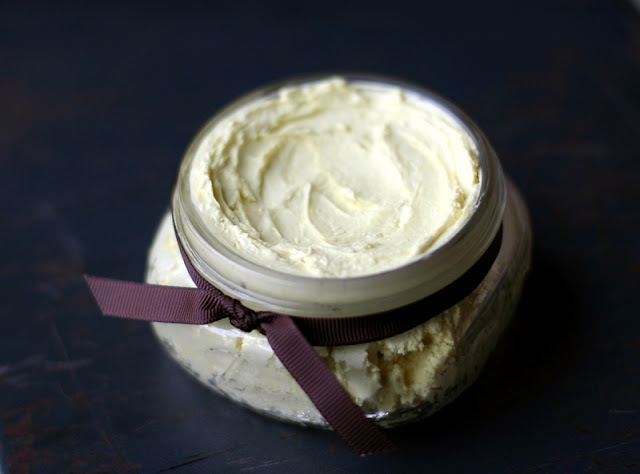 I hope you will make this body butter and have a great time like we did! adapted from here and here! Place the shea butter and coconut oil in the Kitchen Aid mixing bowl, or another bowl, and place it in a saucepan of boiling water to make a double boiler. When the solids are liquefied completely, remove the bowl from the boiling water and allow to cool for 30 minutes. Add the Sciabica oils and stir. Place the bowl in the freezer for 15 minutes or until the oil BEGINS to solidify. Whip the mixture on high until it reaches the consistency of whipped butter. Both of the websites I noted above have photos that will help you with the process, but it is very easy! You only beat the mixture for a very short time! Place your butter in a jar. To use, simply place a very small amount on your skin. The butter melts and you then rub it in. Initially the butter is oily on your skin, but will absorb very quickly. This is a great product to use right when you are finished showering/bathing and before you dry off. My skin is so soft and smooth when I use this. I will make it again for myself and to give as gifts!